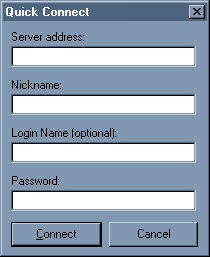 With this option you can quickly connect to a server by only filling in crucial information (of which none will be stored, unlike connecting via the “Connect” option). You need to fill in an i.p. number (like 127.0.0.1) or a dns name (like voice.teamspeak.org:9500). You must give yourself a nickname. If you have registered with the server you are connecting to, you can fill in your login name and password. After that press the “Connect” button and if you supplied the correct data you will be connected. Otherwise press “Cancel” to cancel the window.